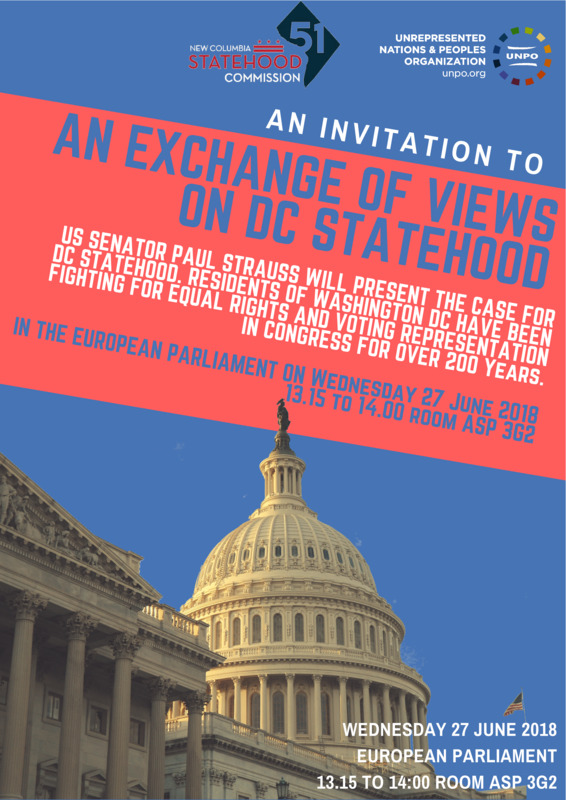 On 27 June 2018, Members of the European Parliament’s Delegation for Relations with the US (D-US) will meet Senator Paul Strauss from DC for an exchange of views on the struggle for the democratic recognition of the District of Columbia as a federal state of the US. Organised by MEP Alex Mayer (S&D); the Unrepresented Nations and Peoples Organization (UNPO) and the Secretariat of the D-US, the debate will inaugurate a series of events on the topic at the European Parliament. The District of Columbia lacks full voting representation in the Congress and control over its own financial affairs. The District seeks full citizenship rights, such as formal voting representation in Congress and equal political rights through the establishment of the 51st State, New Columbia. In November 2016, the people of DC voted 86% to 14% to petition Congress to admit the District as the 51st State and to approve a constitution and boundaries for a new state of 700,000 unrepresented people. Currently, DC represents about 700,000 disenfranchised citizens of the United States: although DC residents have been electing their Senators and Representatives every two years since 1990, the so- called Shadow Senators are in fact are not allowed to vote on legislation or debate on the floor of the Senate. The meeting will be an opportunity to hear from Senator Strauss about the struggle for full democratic recognition for DC in the United States. Questions from participants will be welcome. District of Columbia: Lawmakers Throw Support Behind A Potential Legislation Granting Statehood to Washington, D.C.